Paris/Washington, May 13, 2018 – In June of 2017, five Middle Eastern nations abruptly severed diplomatic ties with Qatar, closing borders, cutting off trade, and recalling diplomats and citizens from Qatar. As we approach the one year anniversary of the 2017 Qatar diplomatic crisis, usually referred to as the “Blockade of Qatar,” we take a look at the impact of the ongoing blockade on the Qatari national airline, Qatar Airways. Overnight, Qatar Airways had to drop 18 regional routes to Egypt, Saudi Arabia, Bahrain, and the United Arab Emirates. This included the very busy and lucrative Dubai route, which had previously seen over 20 flights per day in each direction. 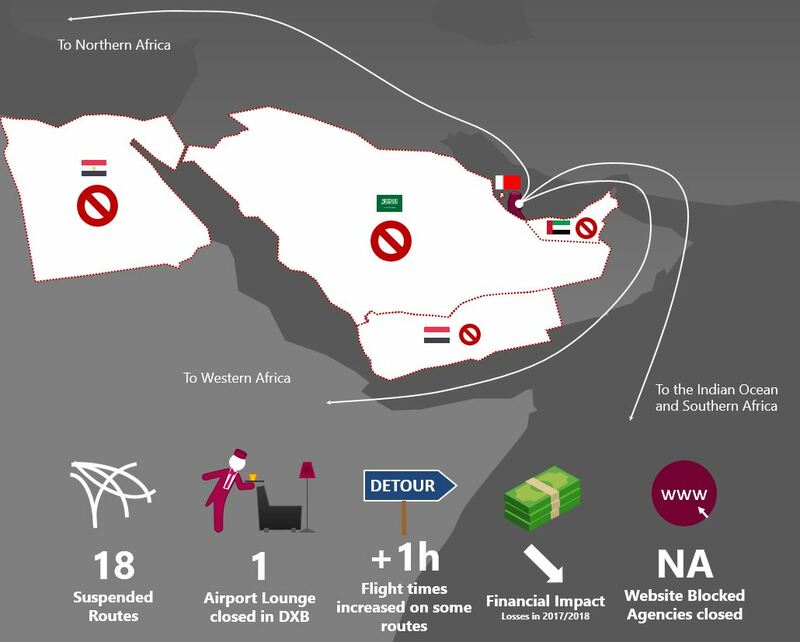 Blocked from doing any business in the UAE, Qatar Airways closed agencies and offices, including its recently opened Premium Lounge in Dubai’s Concourse D. Its website was also blocked in the blockading countries. Not only did Qatar Airways have to discontinue 18 regional routes overnight, almost all of its flight operations were severely impacted by the blockade. Along with the blockade came airspace restrictions. Neighboring Saudi Arabia and Bahrain banned Qatari aircraft from overflying their airspace, isolating Qatar further and forcing Qatar Airways jets to take long detours through Iranian airspace. Some routes saw their flight times extended by over one hour. As a result, Qatar Airways are predicting significant losses for the 2017/2018 fiscal year, after having posted a healthy profit of $540 million in 2016/2017. In a complicated environment of diplomatic crisis and isolation, the State of Qatar and Qatar Airways had to act quickly to keep the airline afloat. With land borders closed, and sea access severely limited, Qatar Airways would become the small Gulf State’s lifeline. Almost immediately following the onset of the crisis, Qatar implemented visa-free travel for over 80 nationalities to facilitate tourism and transfers at Doha’s Hamad International Airport (DOH). The Qatari national carrier released a video entitled “No borders, only horizons” denouncing the isolation imposed by its neighbors. The video subsequently went viral, accumulating over 54 million views. A black and white image of Emir Sheikh Tamim bin Hamad Al Thani, created by a local Qatari artist, soon became the symbol of the resistance against the blockade. 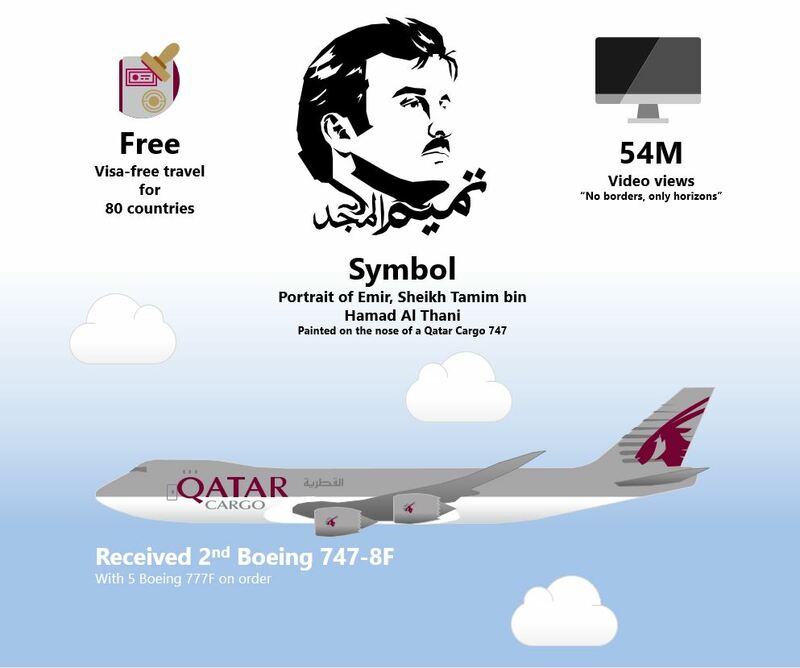 The image can be found on many cars in Doha and was even painted on the nose of a newly delivered Qatar Airways Cargo Boeing 747-8 Freighter. With Qatar’s only land border blocked by Saudi Arabia, the Gulf State had to rely on Qatar Airways, and notably the Cargo division, to provision the country. Currently operating 13 Boeing 777Fs and 2 Boeing 747-8Fs, Qatar Airways Cargo ordered an additional five Boeing 777 Freighters in April 2018 to cope with supply transport demand. With some aircraft grounded following the sudden cancellation of 18 Middle Eastern destinations, Qatar Airways pursued growth plans elsewhere, inaugurating 14 new routes since the beginning of the blockade. The new routes to Dublin, Nice, Prague, Sarajevo, Kiev, St. Petersburg, Skopje, and Thessaloniki in Europe; Chiang Mai, Pattaya, and Penang in Asia; Adana and Sohar in the Near East; and Canberra in Australia, would help to make up for some of the loss of productivity from cancelled routes in the Middle East. Another major event since the blockade was the recent delivery of Qatar Airways’ first Airbus A350-1000. It was, in fact, the very first delivery of an A350-1000 as Qatar Airways was the launch customer of the new stretched model. Flight-Report had the opportunity to attend the lavish delivery ceremony in Toulouse and fly on the delivery flight to Doha. Qatar Airways is well known for the importance it places on the quality of its products in all cabins. 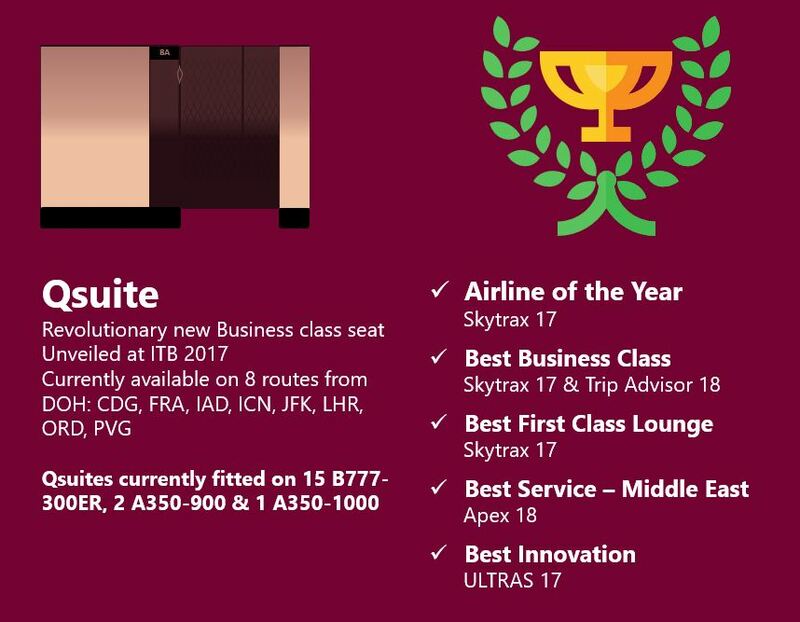 In 2017, the Qatari flag carrier created some major buzz throughout the industry when it unveiled its revolutionary Qsuite Business class seat at ITB Berlin. The new seat, which incorporates many features traditionally seen in First class, is gradually being retrofitted throughout Qatar’s existing Boeing 777 and A350 fleets—and coming factory equiped on newly delivered aicraft. The importance Qatar has placed on offering top-notch products has paid off with awards and recognition throughout the industry. With 386 flight reviews posted on Flight-Report.com, Qatar Airways is no stranger to the Flight-Report community. The high marks found on the many independent reviews posted on the site, known as Flight-Reports, seem to confirm the positive public perception of Qatar Airways’ products. 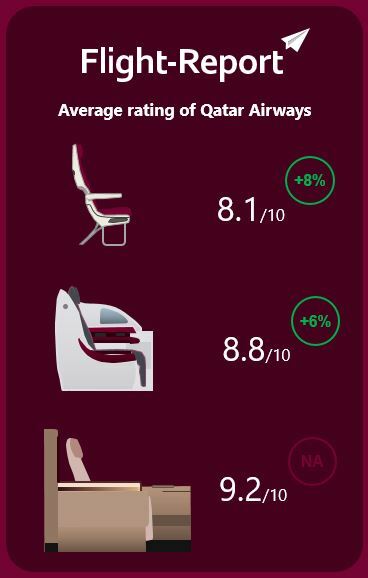 As Qatar has focused more on improving the passenger experience since the blockade, ratings on Flight-Report.com have reflected improvements and trended positively. In the past year, the average rating of Qatar Economy class has gone up by 8% to 8.1 out of a possible 10, while the average Business class rating has risen 6% to 8.8/10. The diplomatic crisis and resulting blockade have made for a complicated year for Qatar Airways, but the carrier has thus far been able to adapt to the less-than-ideal operating conditions. A year after the beginning of the blockade, a part of the Qatar Airways fleet remains grounded, specifically some narrowbody aircraft that can no longer be deployed on short-haul flights with so many regional route cuts. The airline has been able to slow the bleeding somewhat by making some aircraft available for wet lease. Notably, Qatar Airways leased some A320s to British Airways during a strike last year, and may again lease some aircraft to their oneworld partner to ease fleet pressure as they deal with the ongoing 787 Rolls Royce engine issue. The prospect of the blockade lifting anytime soon still doesn’t look promising a year later. The international airline trade organization, IATA (International Air Transport Association), has condemned the blockade as the organization advocates for open skies policies and free trade. Though the blockade has been difficult for Qatar Airways, should the situation persist, it appears that the airline is poised to adapt and remain a relevant player on the global aviation scene. Launched in March 2011, Flight-Report.com sets the standard for detailed and illustrated airline reviews. With more than 9,500 registered users and 18,000 individual reviews, the site has become a reliable source of independent flight reviews and has developed as a community of aviation and airline enthusiasts. Flight-Report is a community website: Reviews posted on the website are written by members of the flying public from all corners of the globe. Flight-Report.com has significant visibility and good SEO with thousands of followers on social media.